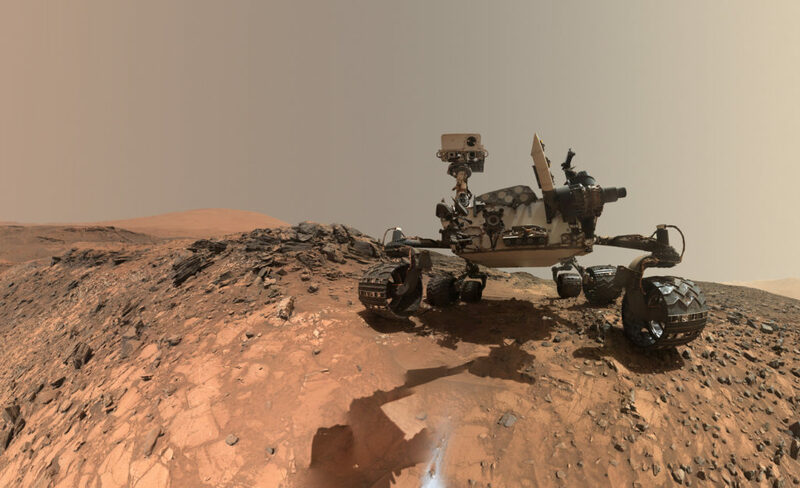 June 23, 2016 – Scientists have discovered an unexpected mineral in a rock sample at Gale Crater on Mars, a finding that may alter our understanding of how the planet evolved. NASA’s Mars Science Laboratory rover, Curiosity, has been exploring sedimentary rocks within Gale Crater since landing in August 2012. On sol 1060 (the number of Martian days since landing), the rover collected powder drilled from rock at a location named “Buckskin.” Analyzing data from an X-ray diffraction instrument on the rover that identifies minerals, scientists detected significant amounts of a silica mineral called tridymite. This detection was a surprise to the scientists, because tridymite is generally associated with silicic volcanism, which is known on Earth but was not thought to be important or even present on Mars. Tridymite requires high temperatures and high silica concentrations to form, conditions which most typically are found in association with silicic volcanism. Scientists in the Astromaterials Research and Exploration Science (ARES) Division at NASA’s Johnson Space Center in Houston led the study. A paper on the team’s findings has been published in the Proceedings of the National Academy of Sciences.